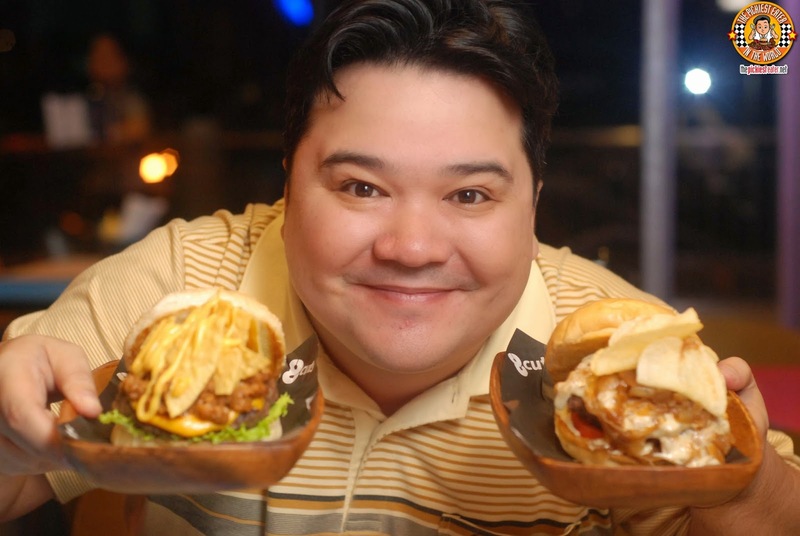 THE PICKIEST EATER IN THE WORLD: 8 CUTS:THE BURGASM CONTINUES! 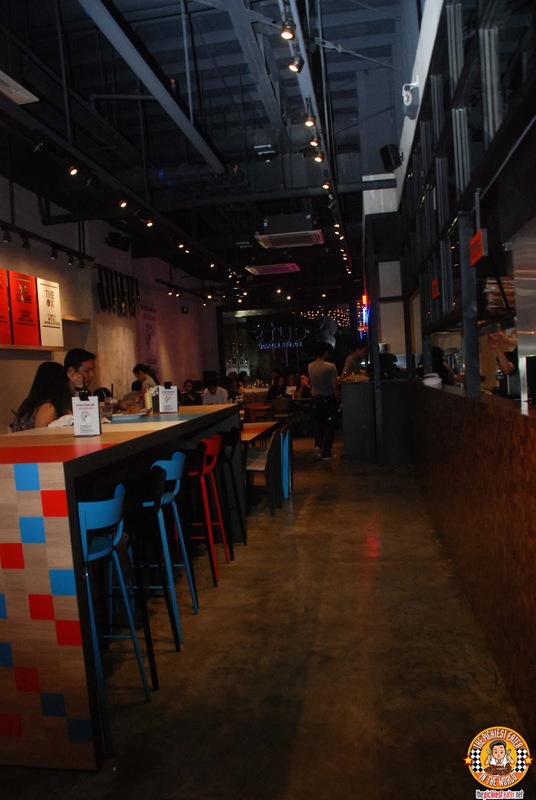 The difference between Burger Bar and 8 Cuts, is that 8 Cuts utilizes.. well.. an "8th cut" - The Ox Tail. The Ox Blend, is something that is not in the Burger Bar Menu.. and is made with the Flank, Ribeye, and Ox Tail. 8 Cuts holds the impeccable standards of service that the Moment Group adheres to. Though 8 Cuts isn't really anything fancy, the attendants are always courteous and attentive, and always willing to give suggestions on what they believe would make your 8 Cuts experience a memorable one. Like it's big brother, 8 Cuts also has that same industrial feel that makes it a cool place to hang out. 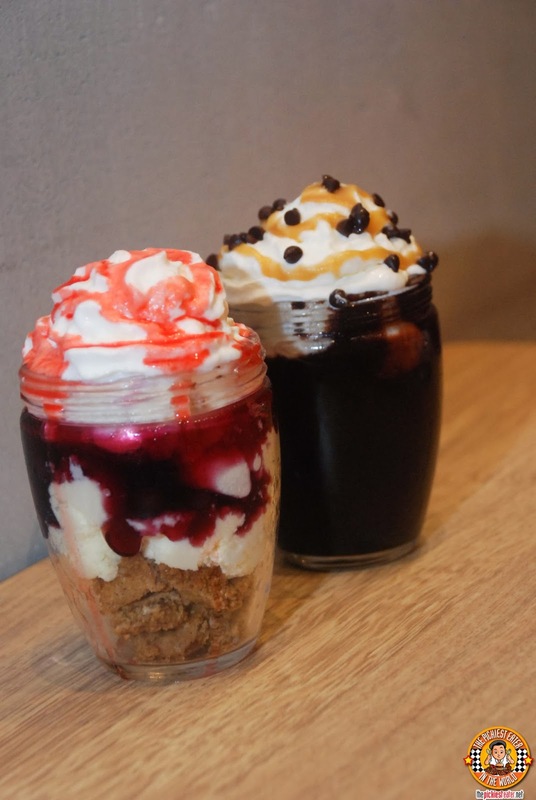 Just like any good Burger shop, 8 Cuts has a delicious selection of Milkshakes. 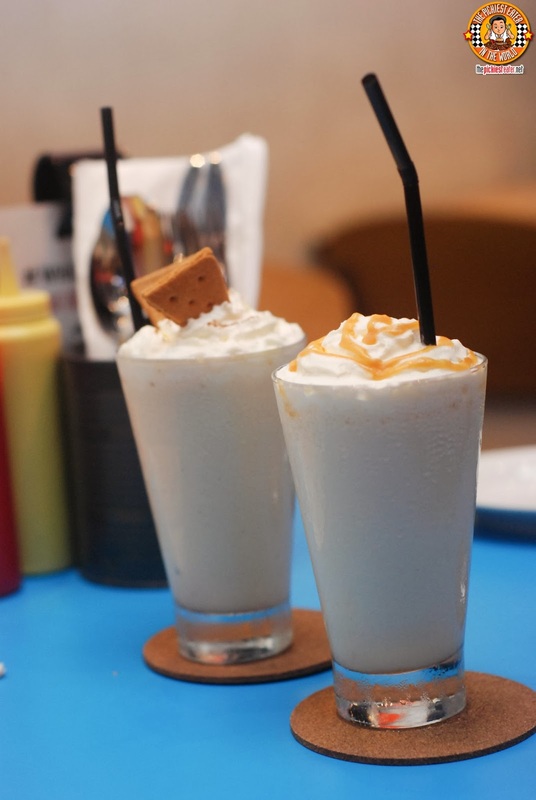 I ordered a Speculoos Cookie Butter Milk Shake (P220 12oz/P295 16oz) from 8 Cut's "Leveled Up" Shakes Selection, while my buddy, "Tales From The Tummy" ordered the Salted Caramel Milk shake (P150 12oz/P180 16oz) from the "Classic" Milkshake selection. Both were rather excellent, with its rich creaminess hitting the sweet spot of my taste buds. 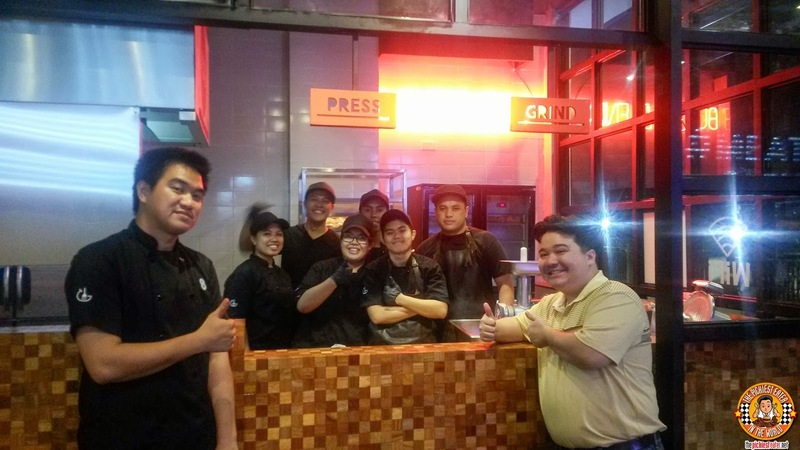 For our first "sides", we tried the Skinny Fries (P45), "Pimped Up" to become "Truffle Parmesan Fries" (Add P100). To be direct, this wasn't very good. 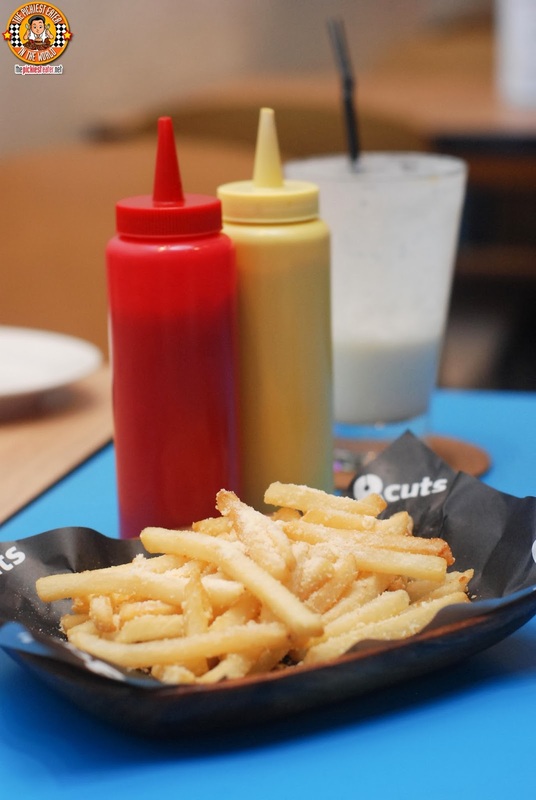 8 Cut's version was nowhere near Cake Club's Truffle fries.. which is my all time favorite. The flavor was rather bland, and.. well.. How do I say it.. really just wasn't very good. I would advise you to skip this if you're at 8 Cuts. We were planning on pimping up our Onion Rings (P65) as well, but our waiter advised us that its usually best eaten as is. And he was right. 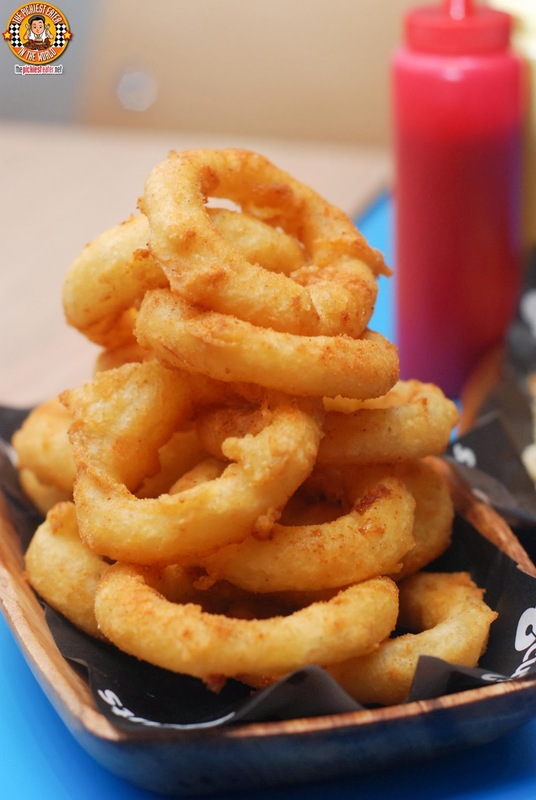 The onion rings have a nice touch of BBQ seasoning dusted on its crispy exterior, giving it a gentle hint of spice that'll hit you at the right moments. That spice melds perfectly with the sweetness of the plump onion with every bite you take. Tales from the Tummy and I both agreed that we couldn't live with ourselves if we left 8 Cuts without trying the Skinny fries, pimped up with Bacon Jam and Egg (Add 70). With the same conviction that I told you that I disliked the truffle fries, I'm telling you right now, that I loved the Bacon Jam and Egg fries. 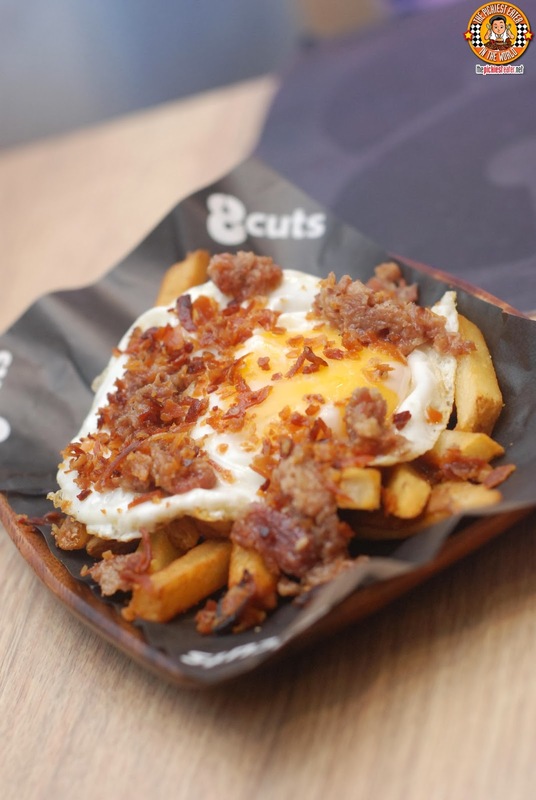 You basically slice up the egg, and let the yolk ooze all over your fries, and mix in with your Bacon Jam, that overs a light sweetness to go with a bit of smokiness. This was one beautiful mess. 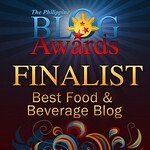 I also got to try their Sweet Potato fries on another visit.. (forgot to take pix hehe).. I would skip it. I was hoping it would taste like 'Cue's but it was far from it. The Grind. 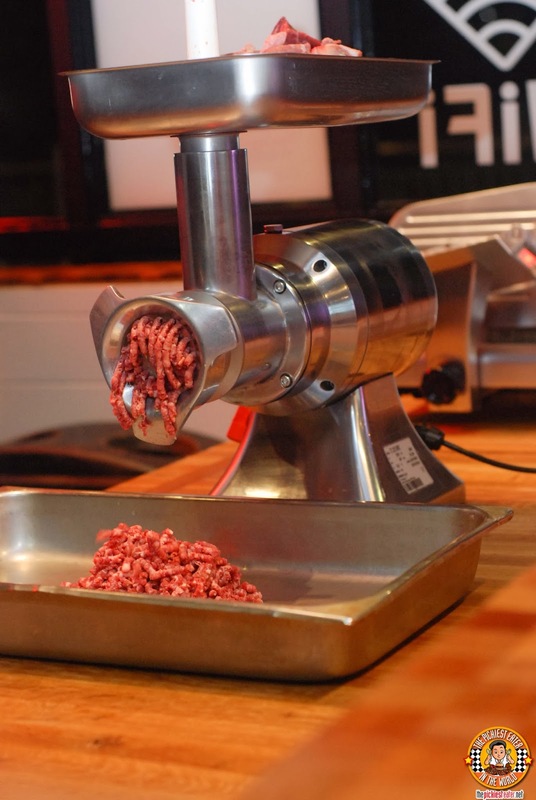 Fresh cuts of meat are forced down the grinding machine, where it is blended with the other cuts, to create 8 Cut's signature blends. 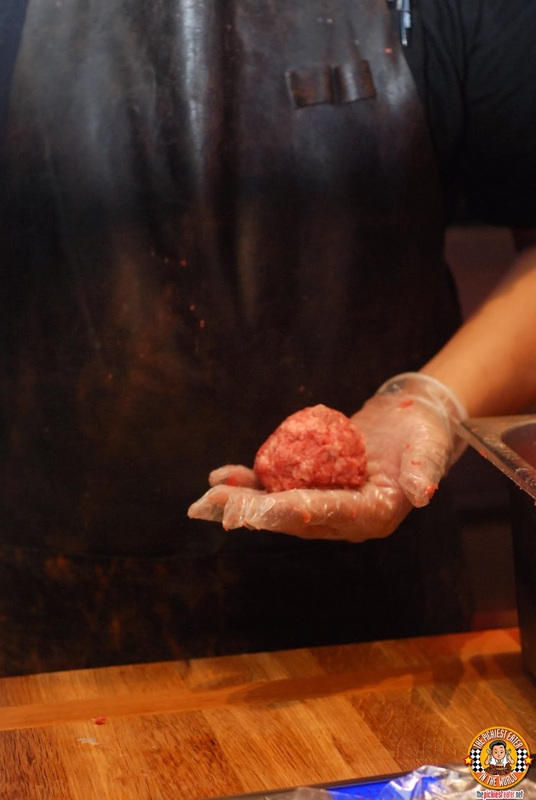 The ground meat is then seasoned and rolled into a ball, where it goes into.. The Press. 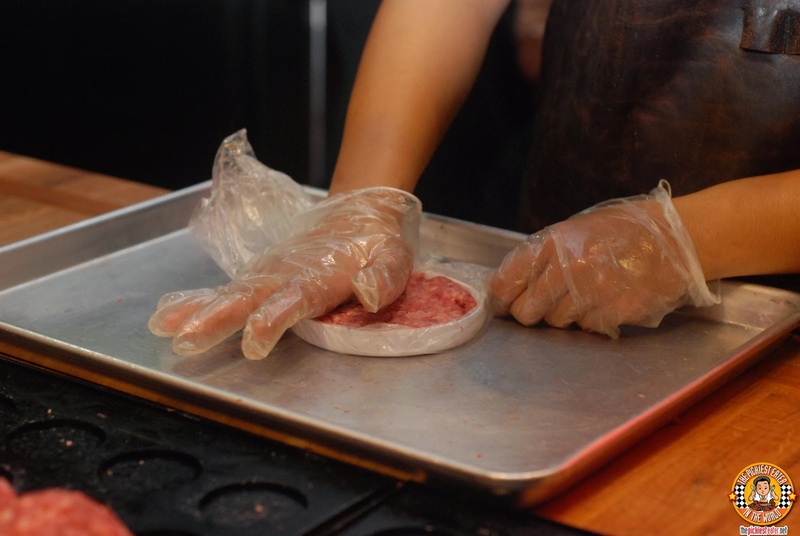 The meat is hand pressed, and formed into patty, and slapped on to.. The Gridlle. The meat is then seared to your liking. Once it's ready, the patty is moved on to.. The Build station. 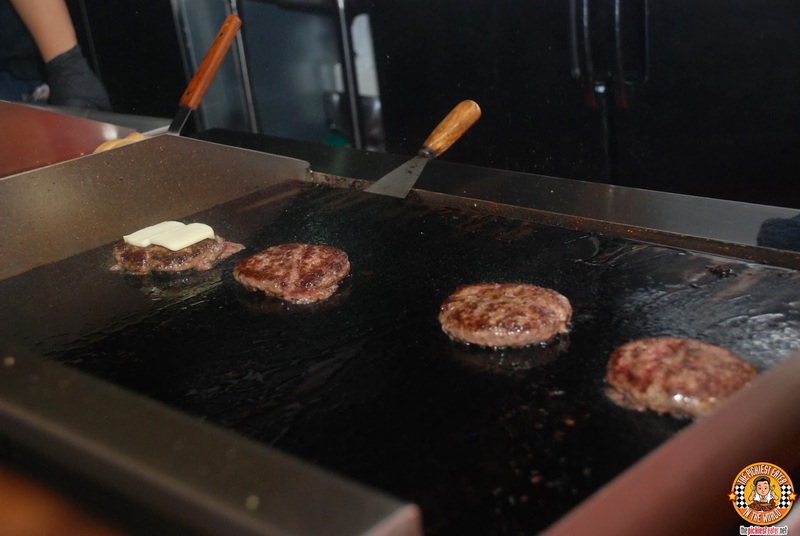 The burgers are then assembled, from the condiments to the sauces, depending on what you ordered. 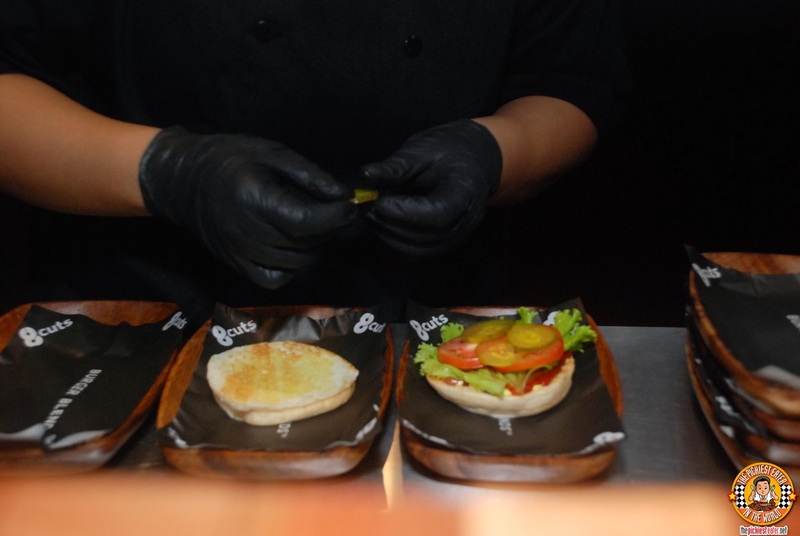 A lot of the burgers on the menu of 8 Cuts are Burger Bar favorites - The Piggy, The Hangover, The Rising Shroom, but there are a few burgers that are exclusive to 8 Cuts. 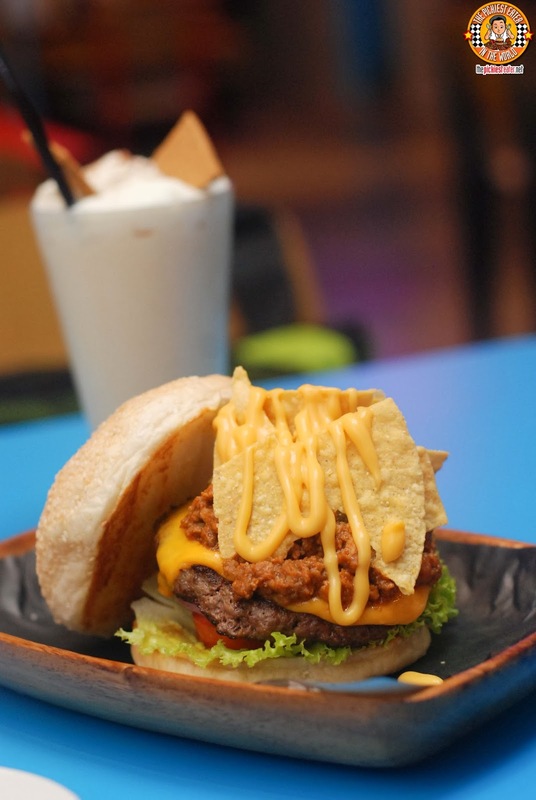 The first burger we tried was the Coney Burger (P255 Single Patty/P350 Double Patty). A quarter pound Big Game Blend patty, smothered in Coney Chili, slathered in Cheese sauce, and topped off with Nacho chips, aside from the basic Lettuce and tomato Condiments. The best way I could describe this, is that its a "Taco Burger". I couldn't eat too much of it because of the chili, but on the whole it was pretty good.. although not really my type of burger. The next burger we tried was the Franch (P295 Single Patty/P385 Double Patty), which featured their Ox Blend Patty. This was all sorts of awesome. The Ox Blend has a distinct gaminess but never loses that beefy flavor. 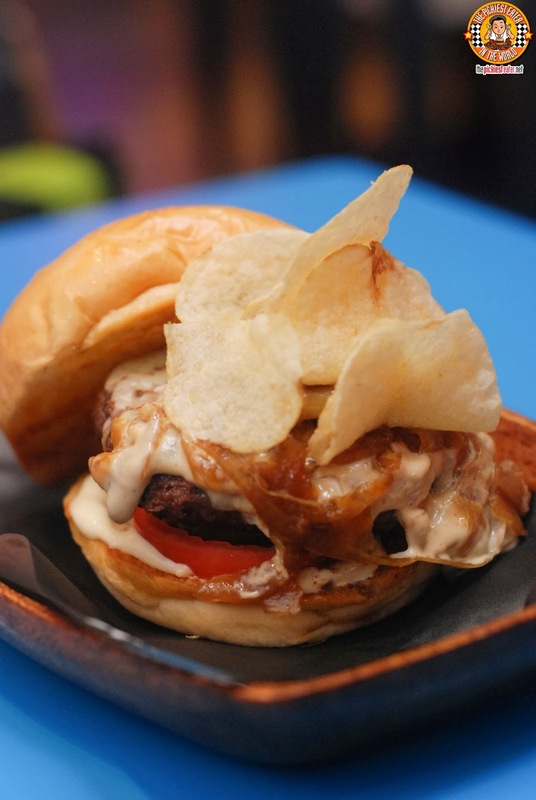 The quarter pound patty is covered in a blanket of gruyere cheese, and topped with caramelized onions and given a good smearing of Ranch Dressing and topped off with potato chips. The Q-Daddy (P295 Single Patty/P385 Double Patty) is the big kahuna of 8 Cuts. 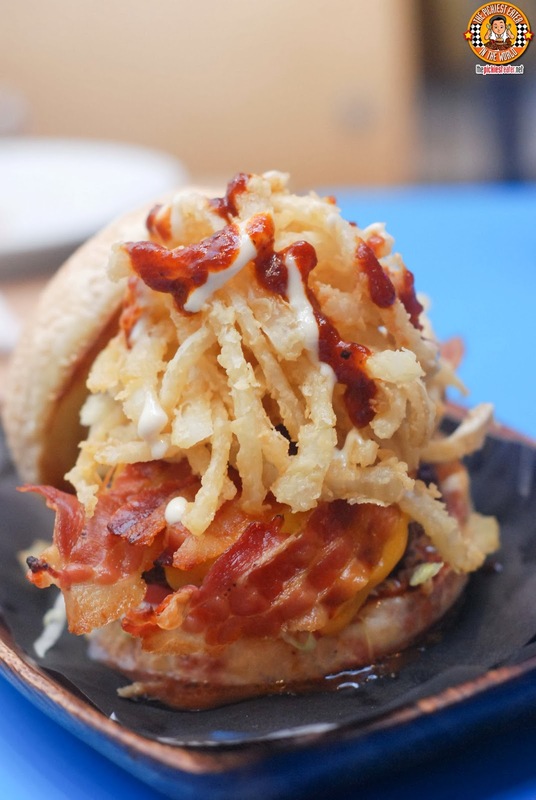 The Quarter Pound patty is covered in a slice of Cheddar Cheese, with a mountain of crispy onion tanglers piled on top of bacon slices, and drizzled with a mix of Jalapeno Ranch and Sweetly spiced BBQ Sauce. This pretty much has everything I look for in a Burger.. Bacon, Cheese, BBQ sauce, and Onion Rings.. It's like it was made specifically with me in mind! I loved the Q-Daddy, and this is most likely what I would order again. Actually I went back a few days ago.. and I DID order it again hehe.. I don't know about you guys, but I'm more of a single patty kind of guy. I would rather fill up on the sides than on just the burger. For dinner, 8 Cuts asked us to sample their Blueberry Cheesecake and the Molten Chocolate Bottoms. I enjoyed how the Blueberry cheesecake (P135) had a nice mix of fruitiness, which just the right amount of tartness to compliment the heavy cream. The Molten Chocolate Bottoms (P135) also had a nice yin and yang of dark and creamy flavors, but.. As I've mentioned before.. My standards of molten Lava cake is very high, and though 8 Cut's version was quite good, it was notches below the one my brother makes. I've been to 8 Cuts twice already, and both times, service and food knocked it out of the park. Sure there were one or two dishes that didn't blow me away, but my overall experience was excellent. I wouldn't mind going back to 8 Cuts again.. Especially now that they opened a branch near my office, at the New Wing of SM MegaMall Mega Fashion Hall! Thanks again to the staff of 8 Cuts! 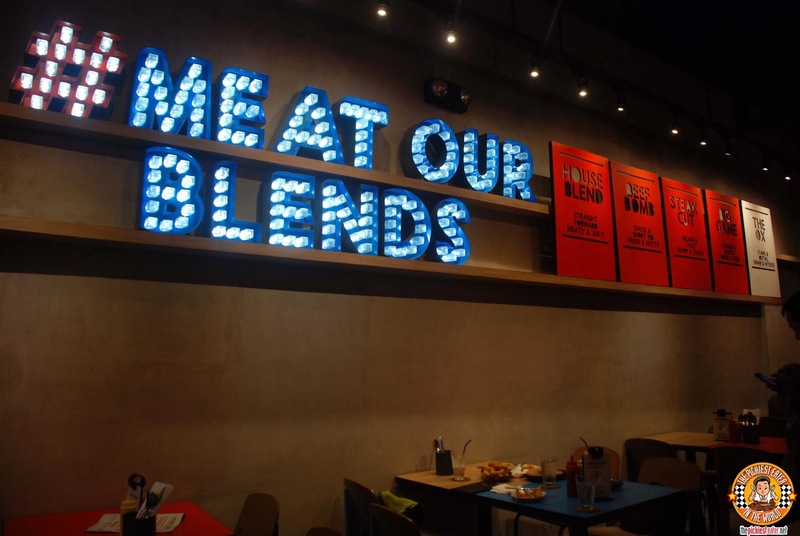 I'll definitely #MeatYourBlends again very soon! that loooks ah-MAZING! i would also go for the q-daddy burger! Dani, I have no doubt that you and I will get along just fine! The Q-daddy burger looks yummy, I wish I could bite it in whole! haha But the ox blends got me curious. Maybe I should also try this! Kat, I was wary about trying the ox blend... but When i did, I think its one of their best blends. Very juicy and tasty! No doubt you should try it! Haha you're lucky you have one near you! I'm glad that they opened one na din in Megamall! Happy to hear you enjoyed, Vincent! Can't go wrong with either the Franch or the Q-Daddy! How to order? they have a menu then just place your order to the attendant?